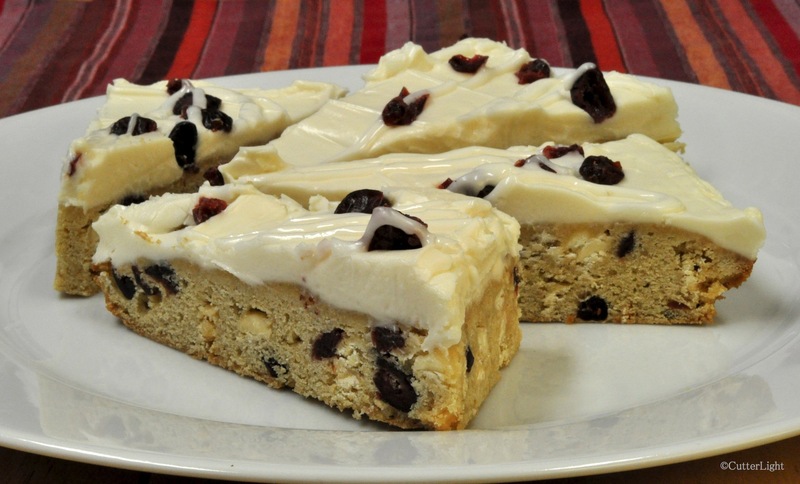 Sweetened dried cranberries and white chocolate chips pair up in a dessert especially appropriate to the winter holidays. People in our generation sometimes still flinch a little when cranberries are mentioned – as they invariably are here in America – around holiday time. Gloppy canned cranberry sauce heated (or not) and served alongside such tasty items as turkey dressing, rutabaga with raisons and mashed potatoes with giblet gravy were, for many of us, the original “I don’t want any of that touching the rest of my food” item. It was always something of a puzzle to me. The packages of whole, fresh cranberries at the grocery store looked so pretty. Why didn’t the grownups use those? It seemed that the advent of mass-produced, mass-marketed food had caused generations of Americans to forget what real cranberries taste and look like, and a debased form of the fruit was kept on menus as a nod to tradition rather than gustatory pleasure. Years later, we discovered the pleasure of cooking with whole, fresh cranberries in our own kitchens, and dishes such as cranberry sauce with tangerines became a much anticipated Thanksgiving and Christmas-time tradition. The tart, bright-red berries sweetened with sugar and cooked on the stovetop are the perfect accompaniment to a holiday bird that has been brined overnight and roasted to perfection. While the following dessert uses dried cranberries rather than fresh, it keeps our cranberry tradition going strong here in the Alaskan Arctic where the local grocer doesn’t carry fresh berries. If you’ve never had a really great cranberry dish, forget everything you thought you knew about these festive berries. You’ll want to save room for this scrumptious cranberry dessert! Butter 9 x 13 inch glass baking dish. Beat butter and brown sugar until smooth. Incorporate eggs, one at a time, into butter mixture. Mix in ginger and vanilla. Gradually mix in flour and baking powder. Fold in craisins and white chocolate chips. Pour batter into baking pan. Even out batter so that it is uniformly on bottom of pan. Bake for 25 – 30 minutes, or until lightly browned on top. Let cake cool in pan on wire rack. Make frosting by mixing cream cheese, powdered sugar, lemon juice and vanilla extract with an electric mixer until smooth. When cake has cooled, spread frosting evenly over the top of the cake. Sprinkle 1/4 cup craisins on frosting. Make drizzle icing by whisking powdered sugar and milk. Fill small Ziploc bag with drizzle icing. Cut off a small piece of the bottom corner of bag. Squeeze out drizzle icing over the frosted cake in zig-zags. Cover cake and refrigerate for a couple of hours. Slice the cake down the middle, lengthwise. Then slice the cake across the width, three time. You will have 8 rectangular pieces. Cut each of these pieces in half, diagonally, to make 16 decorative pieces.